- Dissolve the yeast in water and then add the flour and salt. Mix well and slowly add the olive oil. - Knead the dough on a clean, flat work surface sprinkled with flour, to stop it sticking. Turn the dough around, stretch it out, bring it up and close it in on itself. Repeat as many times as needed until the dough is even, flat and elastic (10 minutes or so should be enough). - Put the dough in a bowl, cover with Clingfilm and leave to rest in a warm place for an hour / an hour and a half until it has doubled in volume. - Now it’s time to shape the dough into as many pieces as you want (for these amounts, four pieces would be a good idea). You can make flatbreads or Mediterranean coques(by flattening the dough to about 1.5 cm), rolls or anything else you fancy. - Place the shaped dough onto a tea towel or baking paper and cover with a damp cloth. Leave to ferment for a couple of hours. - Preheat the oven to 250 °C. Brush the surface of the bread with olive oil, reduce the temperature to 210 °C and bake for about 25 minutes in the case of flatbreads or 30–40 minutes for loaves. You can sprinkle some salt flakes over the surface of the flatbread before baking if you’re going to use it as a pizza base or to make savoury coques, and some people even add extras such as olives, raisins, walnuts or rosemary to the dough mixture. 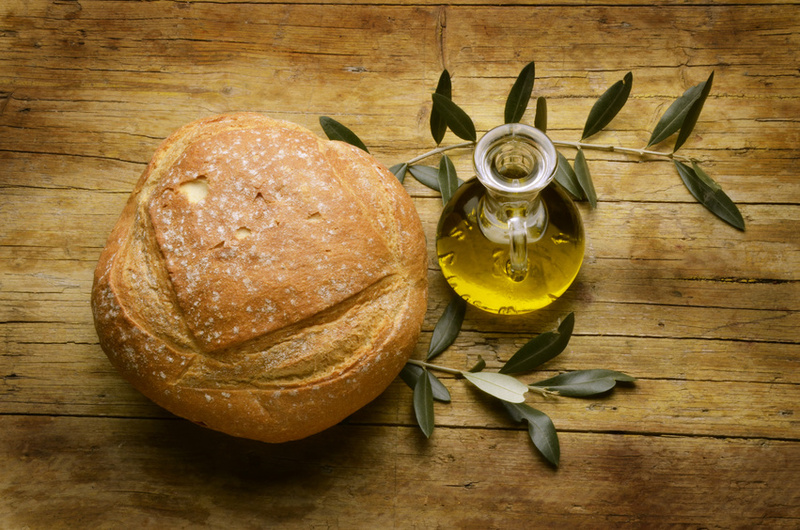 Bread and olive oil. Two simple and delicious foods, especially if you use top-quality ingredients. So how about combining them to create a single product? It certainly takes time, but it’s not that difficult and the result is well worth it.